I've been working my way through the Breakfasts book and trying a few side dishes when I have the ingredients on hand. I love the turkey breakfast sausage recipe! I have several overnight guests arriving in (gulp) less than two weeks and plan to make it again then. How do you like this Danish waffle iron? I picked it up at an estate sale for 50 cents so I can double my waffle output for guests. I have two blender pitchers ready for one fruit batter and one whole grain. I use the waffle recipe at this website. Oh, that's really pretty! It will make your guests feel really special! Do you mix all your ingredients ahead of time? What I do for my waffles is just have the dry stuff mixed and add the liquid ingredients at the time I cook them. How do you keep your waffles warm and crispy for serving while making the next batch? You've inspired me to dig out my waffle iron! I have to say this waffle iron cooks just as quickly, if a bit thinner and crisper, than my electric version. Debbie, when I've made waffles for my small family I just make while they eat. I've read that you should put them on the oven rack on low heat to keep them from getting soggy. I'm expecting our guests to wake up for breakfast at different times, and between two irons going, not to have very many to keep warm. Mom2fur, I've been using the Sue Gregg Blender Batter waffle recipe. It's great! You can use whole oats and wheat berries by soaking and pureeing them in a blender. The mixture sits out all night. All you do in the morning is crack in a couple of eggs with leavening agents and blend again, then pour. Easier than a mix anyday, and much healthier! I love the heart shapes! 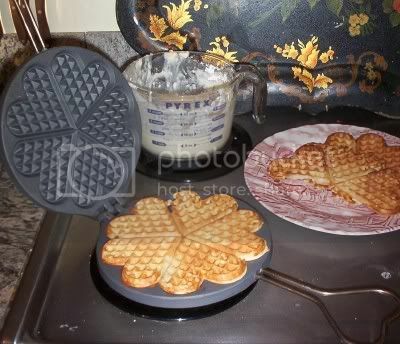 :) If the waffles get a bit soggy while sitting, they can always be toasted to get them crispy again! Hi, I'm a SAHM (married, 3 boys: 10-yr old twins and a 12yr-old)from Holland and frankly, I don't remember how I got here ::blush:: but I enjoy reading yr blog. Thus far I've been reading bits and pieces but will come back to read more. This waffle iron caught my eye, I have the exact same thing but in an electric version. Been trying out different recipes, would you like to share yours? Hi, Baking Soda, thanks for introducing yourself! Love the waffle iron...and what a deal to boot! I"ve made sue's blender waffles using brown rice and they are fabulous, so light and crispy. an Inspired recipe!